The fearless fighter Taraman Bibi has perished away. She was a female freedom fighter who was honoured with Bir Pratik in 1995 for her bravery during 1971. 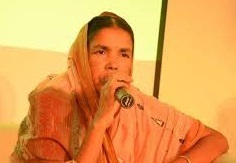 Taraman Begum (born: 1957 - death: December 01, 2018), who was commonly referred to as Taraman Bibi, was a courageous female freedom fighter of Bangladesh's War of Liberation. In 1973, for her courage in the war of liberation, the government of Bangladesh gave her the title of Bir Pratik. Based on the official gazette of 1973, she is at serial number 394. Gazetted name Taraman Begum. Taraman Bibi came into this world in 1957 in village Shankar Madhabpur of Char Rajibpur upazila of Kurigram district. Her father's name is Abdus Sohaban and mother's name is Kulsum Bibi. Taraman Bibi was at Sector 11 in her village Shankar Madhabpur of Kurigram district. Sector 11 was then charged by commander Abu Taher. A freedom fighter known as Muhib Habilder, who was accountable for a camp near Taraman’s village, inspired Taraman Bibi to take part in the liberation war. He brought Taraman to prepare food in the camp. Taraman was only 13 or 14 years old then. Nevertheless having seen her bravery Muhib Habilder made a decision to give her arms training. One day while eating lunch, Pakistani forces bombarded with a gunboat there. Tarman Bibi took part in that situation with her colleagues on that day and conquered the enemies. After that, this fearless woman started to fight with the male acquaintances in several combat. After the liberation of Bangladesh, in 1973, the then authorities conferred Taraman Bibi with the title of "Bir Pratik" on her bravery and heroic contributions in the War of Liberation. But it was not possible to find her till 1995. In 1995, Bimal Kanti Dey, a professor and researcher of Bangla Department of Ananda Mohan College, Mymensingh, found her first. Professor Abdus Sabur Faruki of Rajibpur College in Kurigram, assisted Bimal Kanti in this work. Then some of the agencies which usually operate on female privileges brought her to Dhaka. At that time, numerous newspapers discussed on her. Finally, on 19th December 1995, the government officially conveyed the award of heroism to Taraman Bibi in an uncertain and unlikely environment. There is a book authored by Anisul Huq, 'Bir Pratiker Khoje' written on Taraman Bibi. Taraman Bibi was the central character of a Bengali drama 'Kariman Bewa' written by Anisul Haque. The name of the husband of Taraman Bibi is Abdul Majid. This couple has a son and a daughter. Until her death in 2018, she lived with her husband and two children in Rajibpur of Kurigram. The freedom fighter perished in her residence at Shankar Madhabpur village under Rajibpur upazila of Kurigram on Saturday, as outlined by her son Abu Taher. Bir Taraman Bibi has been experiencing lung infection, lack of breath and diabetes for a long period. She was also provided medication at Dhaka CMH a month ago. Abu Taher stated that his mother's condition was worse on Friday night. At 1:27 pm she left the final breath. This freedom fighter was 62 years old. Kurigram Deputy Commissioner Sultana Parvin said that Bir Pratik Taraman Bibi will be entombed with the state honor at Kacharipara Taltala graveyard in Rajibpur upazila on Saturday. Prior to this, the local administration officials, leaders of various socio-cultural-professional and political organizations will pay homage to this freedom fighter. Prime Minister Sheikh Hasina has expressed deep shock at the fatality of freedom fighter Taraman Bibi. We all pray that may her soul rest in peace and serenity. Her name will always be commemorated by all of us.